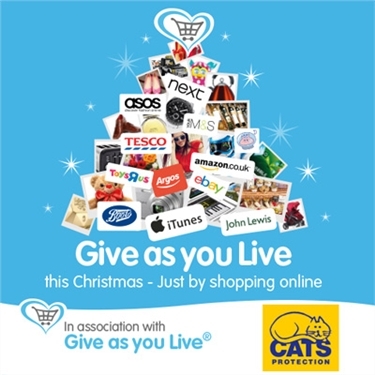 With Christmas only four weeks away, shop through Give as you Live for your Christmas presents at over 3,600 online stores and a percentage of what you spend will be donated to us on your behalf, for free. Plus, if you raise £5 or more through your online shopping by 31 December, Give as you Live will double your donation with a free £5 donation to us! Now that's what we call Christmas spirit! 1. Sign up to Give as you Live on your desktop, tablet or via the mobile app. It’s fast, simple and 100 per cent secure. 2. Shop for millions of products at over 3,600 top online retailers including Amazon, John Lewis, eBay, Expedia and more.